Another Mother’s Day has come and gone. Mother’s Day 2012 marked a significant milestone for me. I’ve now experienced five Mother’s Days without a mother. Five. This feels pretty major. Mother’s Day 2012 also marked another very different kind of milestone. 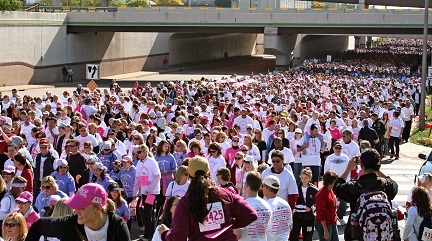 In my neck of the woods, Mother’s Day marks the annual Susan G. Komen Race for the Cure at Mall of America® event in Bloomington, Minnesota. So it’s no surprise there was an extra dose of “party atmosphere” mixed in with the event this year. More racers were expected, more potential dollars were waiting to be raked in, more ads were televised and, of course, more pink was on display or worn everywhere one looked. It was also the perfect day and event for Komen to do more much badly needed damage control. After following the recent well-publicized mishandling of the funding for Planned Parenthood and the fall-out that is still continuing, I’ve been wondering if this particular Mother’s Day race would be impacted. I‘ve been wondering if the numbers would be down. The numbers have been down a bit elsewhere. Historically, this particular race at the Mall of America is one of Komen’s biggest money-producing races in the nation. After all, doesn’t everyone love to run or watch a race and then go shopping? So after all this wondering, I was eager to tune into the local late Sunday evening news because I knew the story would be covered extensively just like last year. I mean Mother’s Day and the Susan G. Komen Race for the Cure®, what could be better for generating some feel-good positive vibes for your Sunday evening local news television viewers, right? Feeling anything other than all warm and fuzzy, would almost be like being anti-motherhood, right? As it turned out, I was not disappointed. There was plenty of coverage. Unfortunately, from my vantage point, the biased coverage was another perfect example of the media’s continuing reluctance to tell the whole Komen story. There was no mention of Komen’s recent public relations problems. There was no mention of the fact the number of race participants was down this year as recently reported by the Minneapolis Star Tribune. There was no mention of any discontent whatsoever. Wasn’t this a blatant omission of an important piece of this particular news story? Even after all the recent fall-out, Komen’s high placement on the pink pedestal seemed to be pretty secure around here. Once again, there sat the smiling anchors oozing admiration and praise for the Susan G. Komen Foundation and for this wonderful annual feel-good event. It felt as if Mother’s Day and breast cancer were both being used for shameless self-promotion by Komen and the news station. There was a lot of “back patting” going on along with all that smiling. However, I wasn’t smiling. I wasn’t feeling all warm and fuzzy; no, I was feeling quite the opposite. Once again I felt fidgety, irritated, even angry, but mostly I felt sad. Because although this event was once again pretty successful for the Komen Foundation, for women like my mother, not so much. Metastatic breast cancer does not seem to garner much attention from Komen. Those living with metastatic breast cancer do not receive much of the support or many of the dollars raised from all this racing. My mother, all the other women (and men) lost to this disease and those presently living with metastatic breast cancer don’t seem to be helped much, if at all by all the dollars raised. This is terribly ironic, but mostly terribly sad. It’s also unacceptable. Did you notice those last three words, breast cancer research? Kind of makes me wonder if even the Bloomington Visitor’s Bureau has been duped along with so many others. There is nothing wrong with wearing pink. There is nothing wrong with walking or running in races. There is nothing wrong with seeking out camaraderie with other survivors. There is nothing wrong with wanting to do something. No, these are all admirable things and I admire all the participants in this and other events like it. However, I do believe the Susan G. Komen Foundation is in the wrong here. It is wrong when you define your mission to be ending breast cancer and yet for the last two years you cut the proportion of fund-raising dollars spent on grants to scientists working on this very thing. 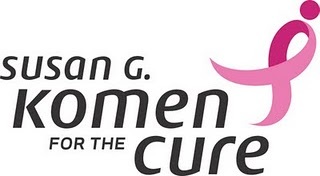 In 2011, Komen allocated 15% of its donations to research awards. This is a drop from 17% allocated in 2009 and 2010. Komen slashes dollars spent on research (already a minuscule amount to begin with) despite the fact that dollar amounts being donated have been rising (until the Planned Parenthood fiasco). A cure without research will never happen. Prevention without research will never happen. Better and less harsh treatments without research will never happen. In addition to the small amounts being allocated to research, Komen has also come under criticism for what research projects it does fund. Two wrongs definitely do not make a right. It’s not only important to do research, it’s important to research the right things. I’m slightly encouraged because people are beginning to wake up to the reality of Komen’s numbers. People are beginning to be dissatisfied with the shockingly dismal amount of dollars allocated for research. People are beginning to demand better accountability. People are beginning to not settle. However, beginnings are merely that, beginnings. Now we need to move on to meaningful action and meaningful change. Now that would be something worth celebrating. Do you choose (or have you ever chosen) to participate in Komen events? Why or why not? Are you satisfied with the dollar amounts Komen allocates for research? Do you feel Komen offers too little support for those living with mets? Do you believe an important part of the news story was omitted here? Another very good post on this subject, Nancy. Thank you. I, too, feel uneasy about these events. I do not discount the immense sense of hope & common cause so many women have gotten from Komen. But that is simply not enough. Julie, I agree. My “problem” is not with the participants. Thanks for sharing about your thoughts of uneasiness. Thank you, thank you, Nancy, for exposing the truth about Komen. It’s attachment to Mother’s Day and the celebration of motherhood has much to be desired. In fact, it’s shameful. But what do you expect from an organization that tries to hide its statistics behind mothers and apple pie? I don’t participate in Komen events, and don’t plan to. Ever. For the very reasons you enumerate. Keep writing! Jan, I was really disgusted by the news coverage. 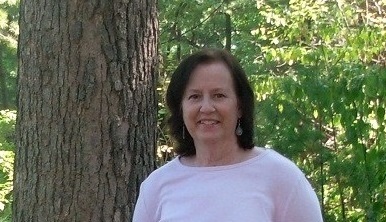 It was completely “fluff.” I don’t have much time for “fluff” when it comes to breast cancer. I know you get it, Jan. Thanks for sharing your thoughts. Disappointing to see that so many people are still prepared to run, despite all the adverse publicity. Even here in England we know about the Planned Parenthood debacle. Maybe, as you say, the reduced numbers are the beginning of a turning away? Ronnie, It is disappointing isn’t it? The numbers were down up until a week ago, however, this fact was not mentioned in the newscast. I haven’t heard what the final numbers turned out to be, but I will be paying attention. It seems to me this should have been part of the story, but it was not. Thanks for commenting, Ronnie. It is quite amazing that after the planned parenthood story, this angle wasn’t covered by the media. I suppose you are right, they were looking for a warm & fuzzy news topper. Not actual news. Catherine, Yes, clearly it was all about a warm and fuzzy newscast. It also appeared that the news station was trying to use the occasion for shameless self-promotion. It was a pat-on-the-back event for them. Thanks so much for adding your thoughts. This is another example of strategically placed PR. It is inaccurate, biased, damaging, and, as you say, a mockery. Should journalists get away with this? Will Komen get away with it? I cannot predict the future, but as we can see here, they sure will try. Onwards and Upwards, Cancer Rebels! Gayle, It did seem to be strategically placed PR for both Komen and the television station. It seemed as if the tv station was trying to self-promote almost as badly as Komen. I do not think journalists or Komen should get away with not telling the whole story. As you said, time will tell… Onward and upward for sure. Thanks for stopping by. I’m cheering from my chair in NY! Nancy.. this is an AWESOME post… All the dots connected (spectacularly, at that)…. and yes, it IS ALL ABOUT THE METS. And YES, IT IS JUST THAT SIMPLE. Love this post and love you too! Ann Marie, Thanks for cheering for me from NY! I can hear you loud and clear! It really is that simple isn’t it? Without mets in the conversation, there is no conversation. Without mets awareness there is no awareness at all. Outstanding posting, and I hear you loud and clear. Totally resent the SGK has the audacity to pair itself up with Mother’s Day. When I was fresh out of treatment and didn’t know better, I participated in two of the races. No more. Done, totally done. I’m so sorry you have been without your mom. I can’t imagine how hard this holiday has been for you and how mocking this event must seem. I can’t even bear to watch the news when there is such an event on. Beth, Perhaps next year I won’t watch. I really thought there would be discussion about the recent events and the lower numbers, but no… I was wrong. Thanks for understanding and for adding to this discussion. Have you ever written about those events you participated in? Our perspectives sure can change can’t they? Great post Nancy. 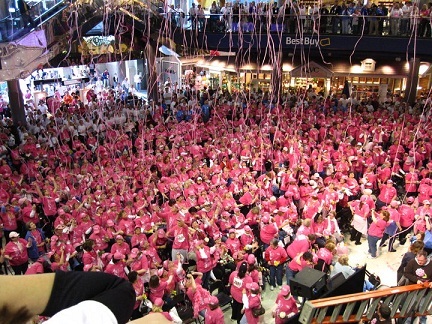 Interesting images that I’m trying to combine in my mind – giant shopping mall and Race for the Cure. Were you surprised by the media coverage? Do you find real news on TV? I haven’t, so I don’t look there. 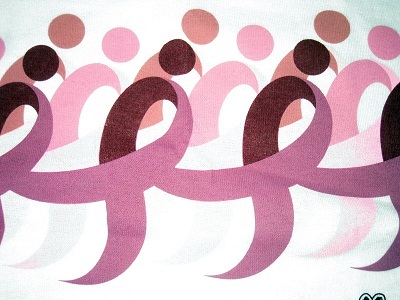 I haven’t participated in any Komen races for some time, but used to participate as a member of my sister’s team. She has survived breast cancer twice, so I’m up for supporting her in whatever makes her feel empowered. You have to admit, there aren’t a whole lot of other opportunities to surround ourselves with literally thousands of women who share our relationship to that dreadful disease. Susan, I was surprise somewhat by the missing pieces to the story. Then again, I wasn’t. Guess I was disappointed more than anything…You’re right, many do benefit from the support of all those people surrounding them. My “beef” is with the way the money is spent, not with the walkers/racers. 15% on research is inexcusable when your mantra continues to be “cure.” Thanks so much for commenting, Susan. Great post on the whole Komen Kool-Aid drinking fest. And I’m really happy to see someone else use the word “unacceptable” with regard to the many deficiencies in the breast cancer system (not to mention women’s health care period). Komen’s miniscule funding for research is unacceptable. The current methods of screening are unacceptable. Mastectomies are *completely* unacceptable. And don’t even get me started on the whole “treatment” (or is it torture?) stuff. Please keep writing, keep questioning and keep advocating for our BC sisters, mothers, daughters, and friends. You’re doing your mom proud. Diane, Thanks so much for reading this post and for adding your thoughts. A lot of things are pretty unacceptable aren’t they? I plan to keep questioning and advocating when I can. I know you will too. Thanks for the sweet words about my mom. That’s a good idea: writing about the SGK events I participated in. I think I will do that sometime. Perspectives change all the time, don’t they? Thanks for understanding. Beth, Yes, perspectives certainly do change over time. I would love to read about some of the SGK events you participated in and how your feelings about doing so have evolved. I bet it would be pretty interesting!